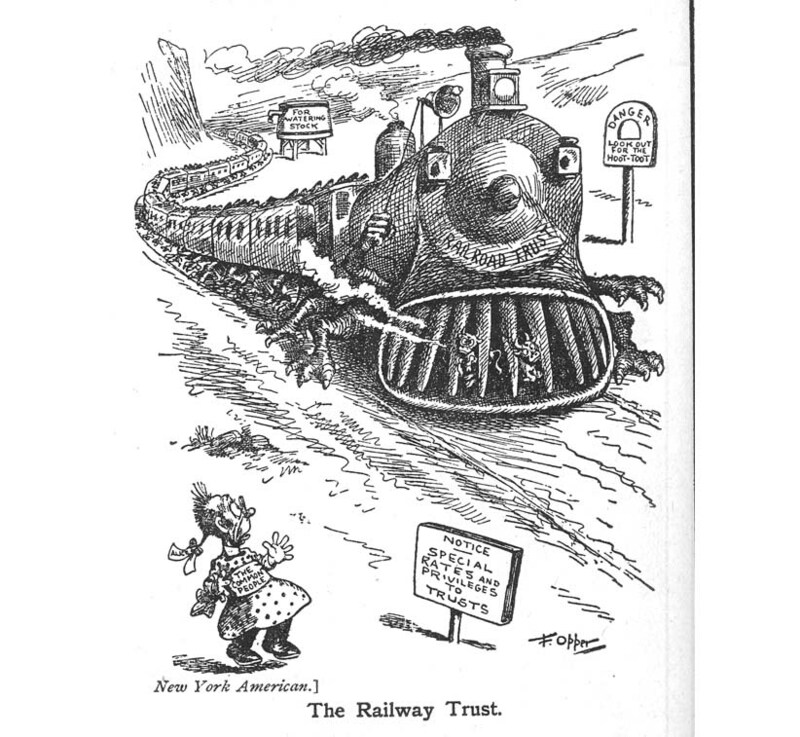 “Every contract, combination in the form of trust or otherwise, or conspiracy, in restraint of trade or commerce among the several States, or with foreign nations, is hereby declared illegal.” Sherman Antitrust Act 1890. Only in the early years of the next century did Congress try and enforce this measure. Roosevelt had been McKinley’s Vice President and on the latter’s assassination, became President, formally elected in 1904. Roosevelt was a cartoonist’s dream physiognomy, identifiable facial furniture in his characteristic pince nez and a beaming almost homicidal grin. He was a young and adventurous man with a most dashing set of career referents (the Rough Riders). Through the dignity of Office he may be rendered as a Statesman but was always available for a vigorous expression and a wider range of movements and narrative settings than Presidents before him. His face and its crazy ways also influence, I do believe, the British painter Francis Bacon’s grimacing screaming heads. H.L.Mencken on Politics Vintage New York 1960p.254, “The Men who Rule us” October 5th 1931. 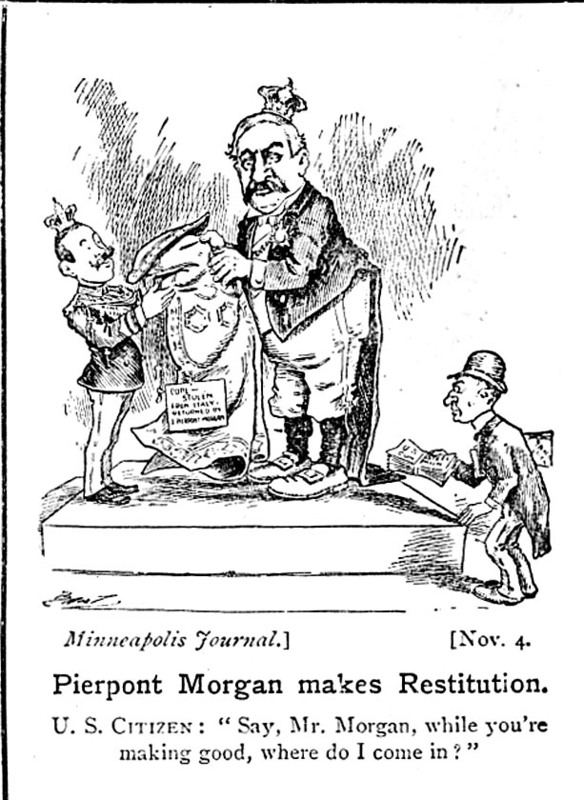 01 NOV 1904 MINNEAPOLIS JOURNAL - US: Bart draws attention to an act of restitution by Pierpoint Morgan, returning a Cape to the King of Italy. 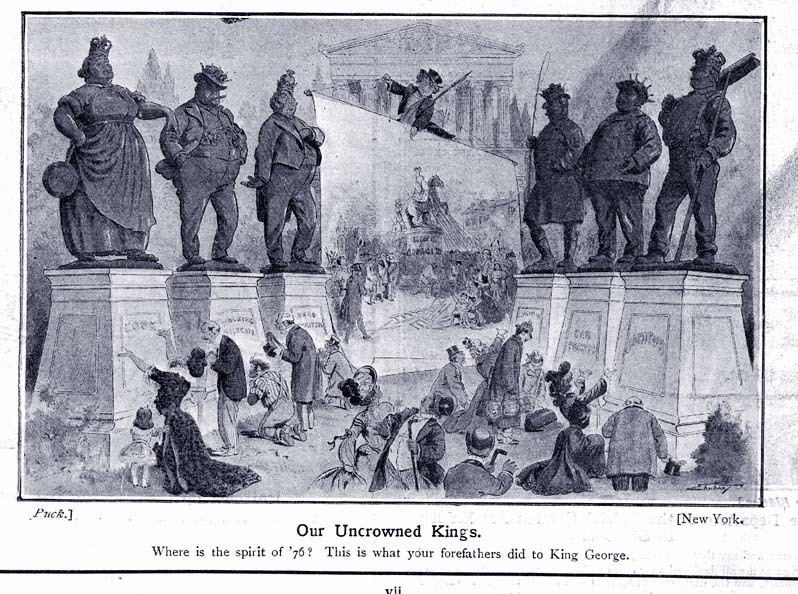 A version of the Small Man (here the Average Citizen) also calls for restitution. 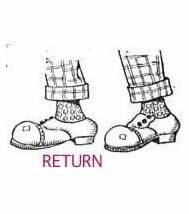 Knee breeches are the mainstay of guying the Banker, mocking his pretensions. Adequate enough but sharp observation to the face. 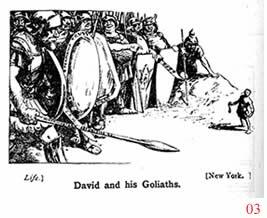 03 1904 LIFE,a beautifully composed ganging up of Goliaths against the David figure of President Roosevelt. 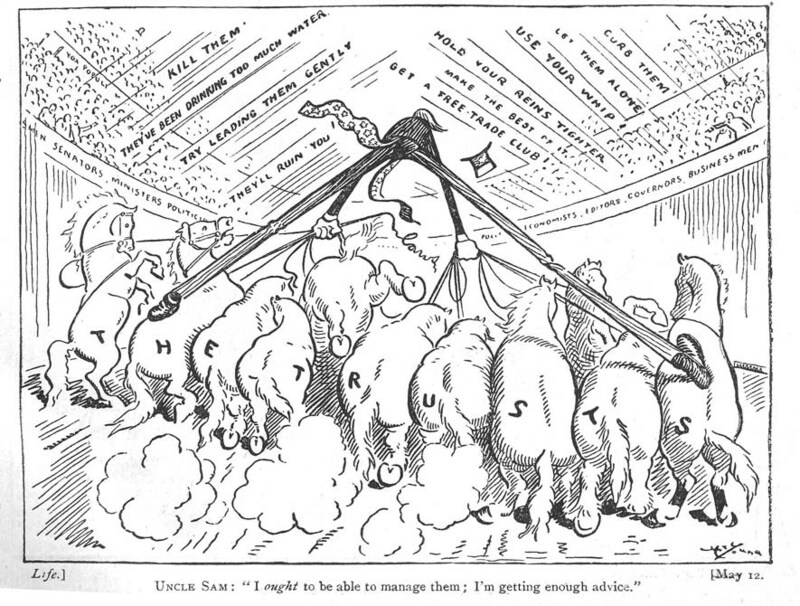 The vaguely Teutonic set of mammoth Knights glare down on the little Roosevelt defined by his pince nez strap- the Sugar, Steamship Trusts are identified and the Northwestern Securities, the first to advance. 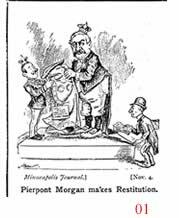 When Roosevelt met Morgan he was surprised the Banker treated him as just another commercial rival, completely disregarding Roosevelt's electoral mandate. One sword that emerges from the group bears the initials 'JPM'. Great thing about using a story everybody knows is that you don't have to imply and ending. 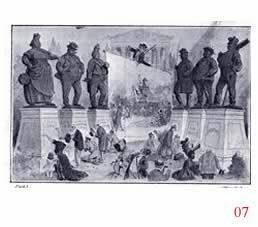 Well drawn point of view throughout, and particularly the diminutive figure seen from above - always a challenge. Anon artist. Loks a bit Jugend in drawing style. 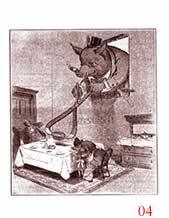 04 1904 PUCK , a wonderful and original image, the thieving Porker - and as vigorous an image of the trusts as you will find. It is a shame that the artist felt so insecure that everything has to be labeled, even the clearly legible loaf of bread.Oh the expression on the Porky face, with his tiddling Top Hat and Neck Tie. Such delicacy and grace in the operation of the pincers stealing bread. The table fits the carpet exactly as the Mother comforts the Child, and the Bread Winner recoils at the spectacle. I love the height of the Home of the Small People, made necessary by the scale of the window that has to accommodate the Fat Pig. Looks more like a prison or orphanage. Drawn with a wash which intensifies the mood. The next time we see such graphic hardheartedness is in the early years of the Soviet revolution where Porky Bankers with teetering hats break loose again. 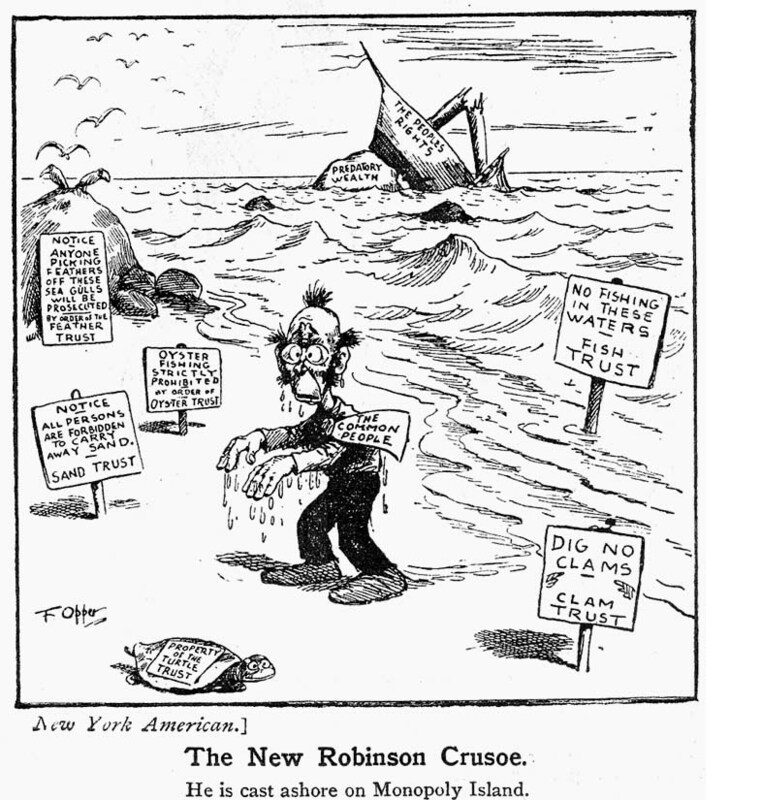 05 1904 New York American, and another fine Opper.The new Robinson Crusoe (as The Common People) tells us what to expect, and it is Monopoly Island. Just for once the labelling works, as the notices would be there any way. The People's Rights founder on Predatory Wealth. The Clam Trust, the Turtle Trust, even the Feather Trust. Very effective this and drawn with those nervous tufts of hair that Opper affects. 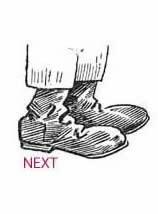 The whole idea of the Common Man being such an unfortunate Dimwit -with beady eyes and a simian upper lip - has to be questioned somewhere, somehow - but not now. The hands have to extend to allow him the joy of drawing dripping water - for once not the sweat of the harassed man. 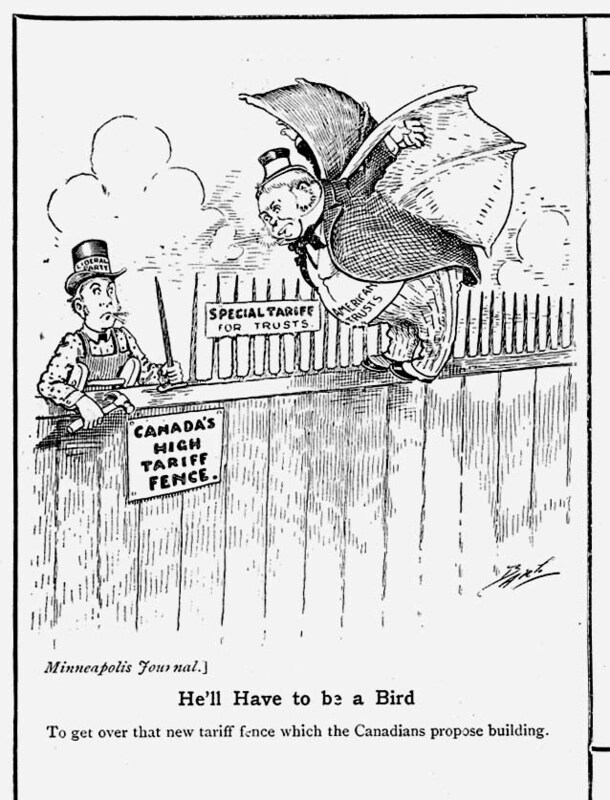 and how even Roosevelt's efforts against the monopolistic tendencies of Big Business were seen as puny. 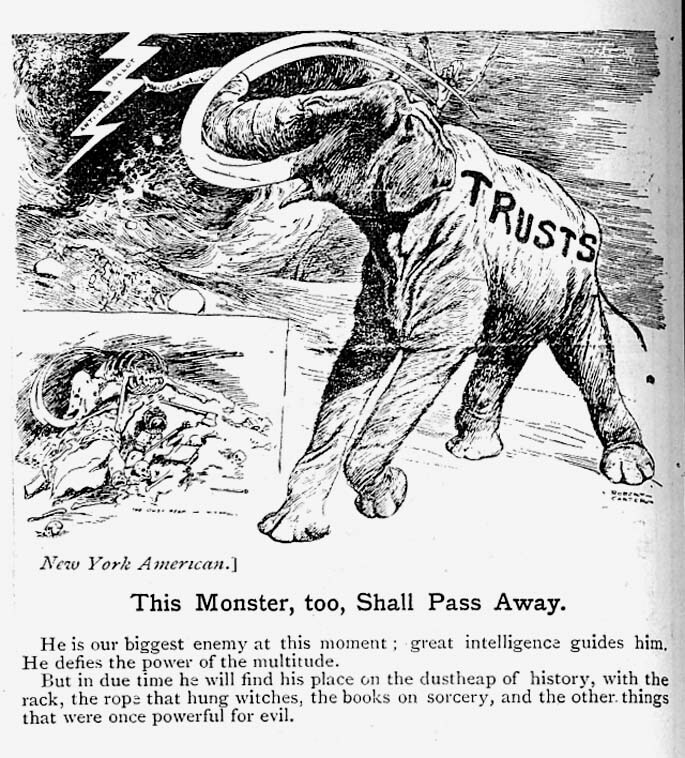 To personify the Trusts as a Mammoth or other roaring prehistoric beast was common throughout the World, because it showed the massive power and the violent response while we knew exactly the outcome in the eventual destruction of of the outmoded beast (such innocence !) Here the scene of its terrorizing is set in a Zoo - the protection it is afforded. 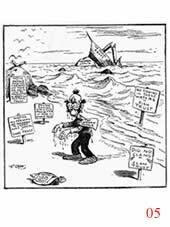 The Sherman Act (see beneath) was little enough and Roosevelt had not yet formulated anything more robust. 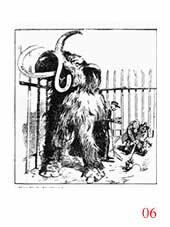 The Mammoth is borrowed from Winsor McCay, who could draw one as easy as shelling peas, all matted fur and immense tuskery and trunkery. 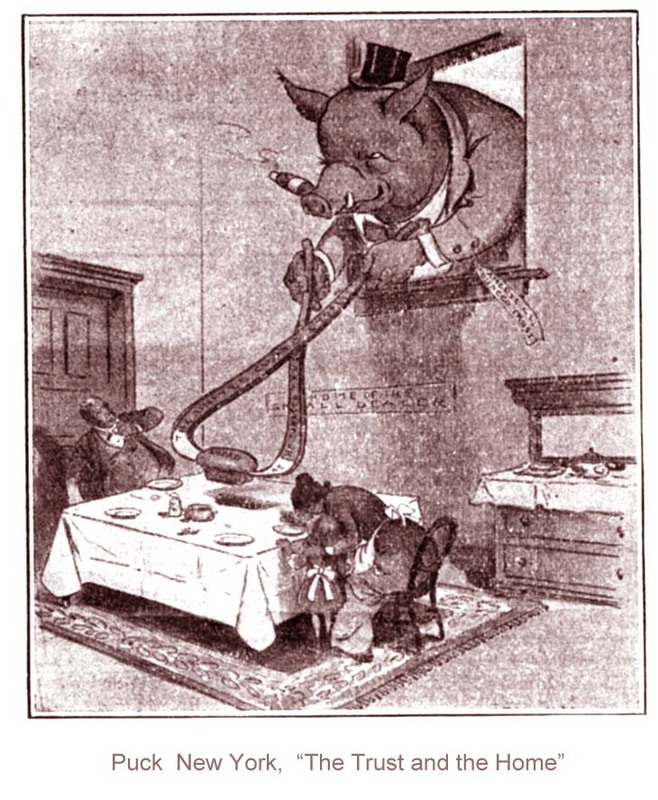 Roosevelt has his pince nez and his Roughrider Hat, heightening the ludicrously timid attack on the mouse. Poor Foraker has so little of a visual identity he has to submit to the Luggage label. 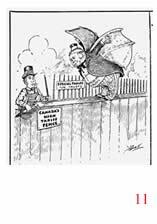 07 1904 PUCK, a pause in the Images of Trust, that the American Public was too uncritical in its toleration of the Bugaboos of the Age- on the left the Backhander. Difficult to read the detail so I will comment no further. Delicate French feeling to this lovely drawing with scarcely concealed contempt. 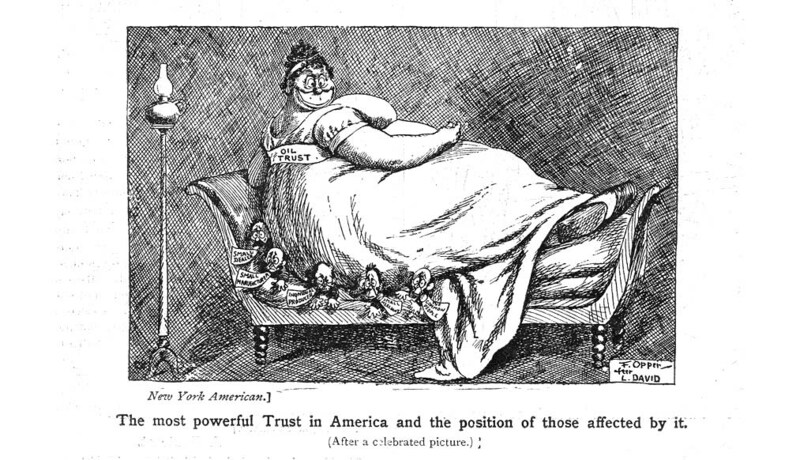 08 1904 New York American, and Opper at work with that familiar schtick - the cartoon that assumes you know the painting, here Jacques Louis David's Madame Recamier. 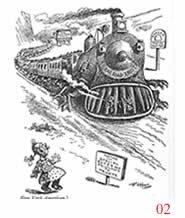 The Oil Trust has magically transformed the slim elegant original into a fat overblown horizontal who squelches beneath her the various incarnations of the Little Man - the Small Dealer, the Small Manufacturer, the Independent Producer etc. 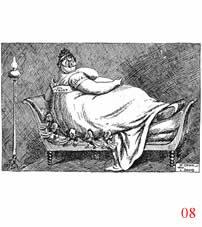 They are trapped beneath her haunches and it is not pleasant despite her wide (too wide) smile. Opper tries to give the drawing the tonality of the original painting with skillful and satisfying hatching . I do prefer "after" than "with apologies to.." which is never truly felt and is always a note of false modesty. 09 1904 LIFE , looks like 'Young' the artist. 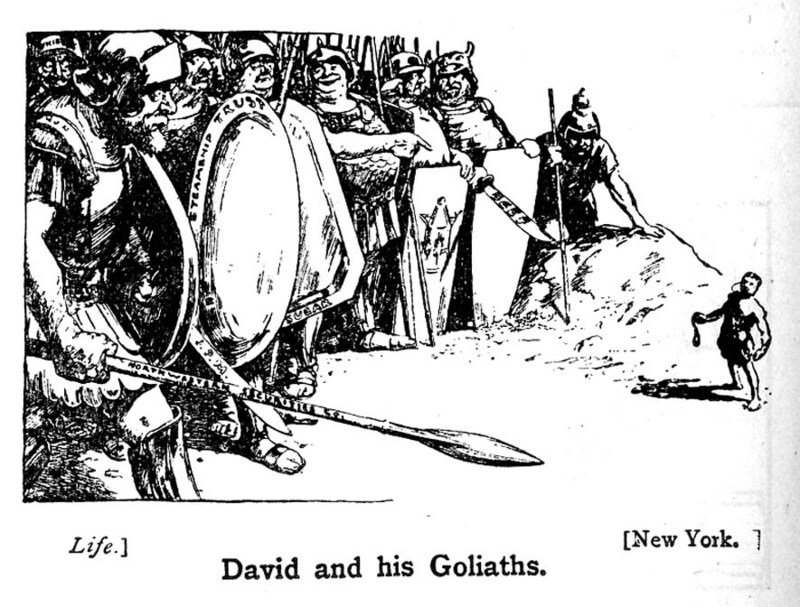 The Trusts as capering beasts held barely in check by Uncle Sam as they career round the Arena. The barrage of advice from the audience (detailed around the balcony front) is an interesting summary of responses to the problem of the Monopolies. "Leave them alone" . It's a shame each horse's arse bears a label. The drawing is very capable and the proportions of the rider carefully drawn. 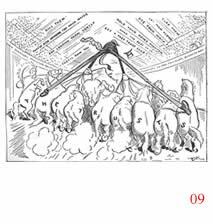 The line style is unusual but heavily influenced by Wilhelm Busch - that firm but nervous line - see what the whip does - drawing the knees as a crimping process.I admire the star patterned coat tails worn by Sam - all adding to the turbulence. Could this work with Sam riding towards us ? Probably not because this way he does look out of control. 10 1904 New York American, and as good as it gets with a great cow and a Rockefeller to boot. 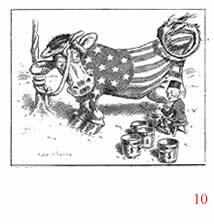 Not an original concept this -the Milk Cow, but with what spirit the Cow is drawn as a walking Stars and Stripes.Such an expression as it gazes in disbelief at what the grinning skullfigure of Rockefeller is bucketing from the swollen udders of the National Economy. 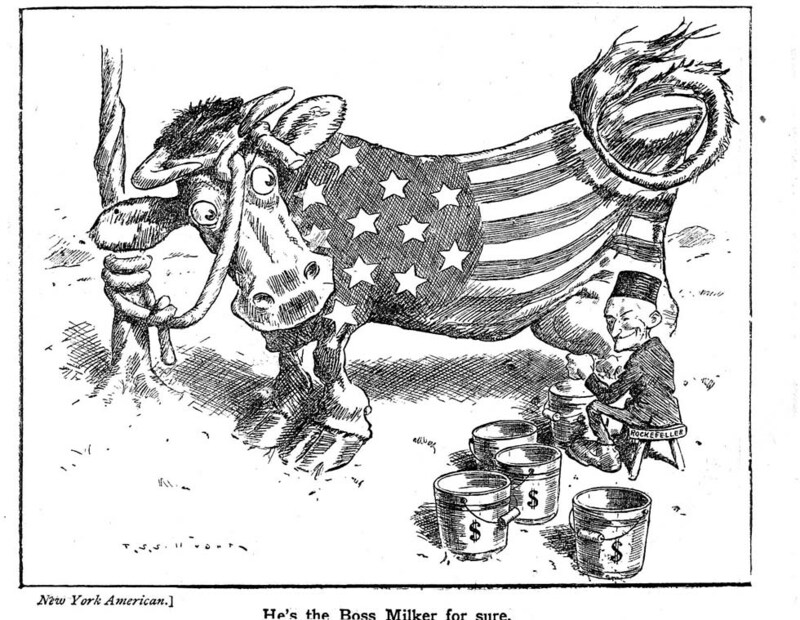 It is not without its own ambiguities as this cow is pretty stupid and unable to help itself. Look at the precision of the drawing of the rope around the horns and unconvincing tree. And have you ever seen such hooves ? 3. the lack of decision in constructing the wings - organic here and mechanical there. Full marks for the shiny shoes and spats worn by the Trust and the nails in the mouth of the Canadian Carpenter. 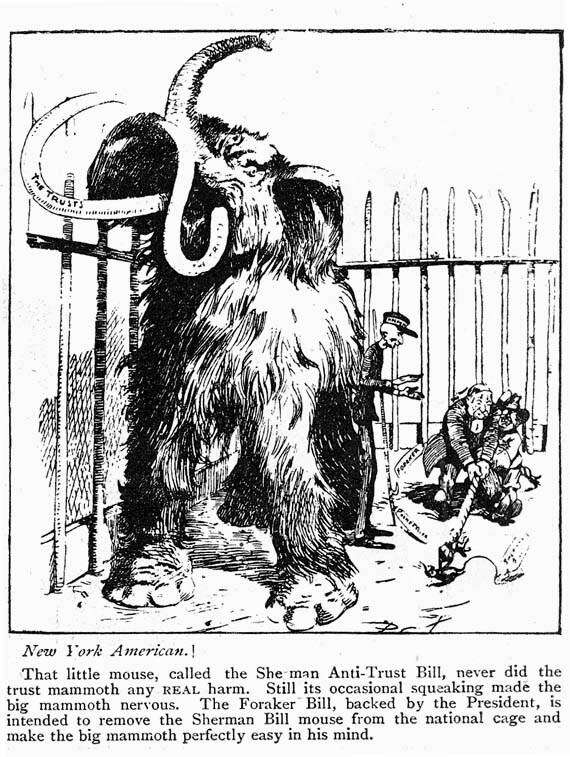 12 1904 Minneapolis Journal, and useful if nothing else to give you a woolly Mammoth to compare with the other. 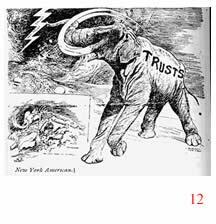 A continuity of symbol but here unfettered by the confines of the Zoo, this Mammoth rages in the Wild while the Caption (worth seeing in the full version) promises extinction to the Creature that defies the Multitude of Voters (see reference to the proposed Anti-Trust ballot). More observations on the next screen -including a listing of the individuals held responsible for the TRUSTS.